Soooo I had this 5lb of russet potatoes in my kitchen that were really all oddly shaped and weren’t going to make much of a baked potato. 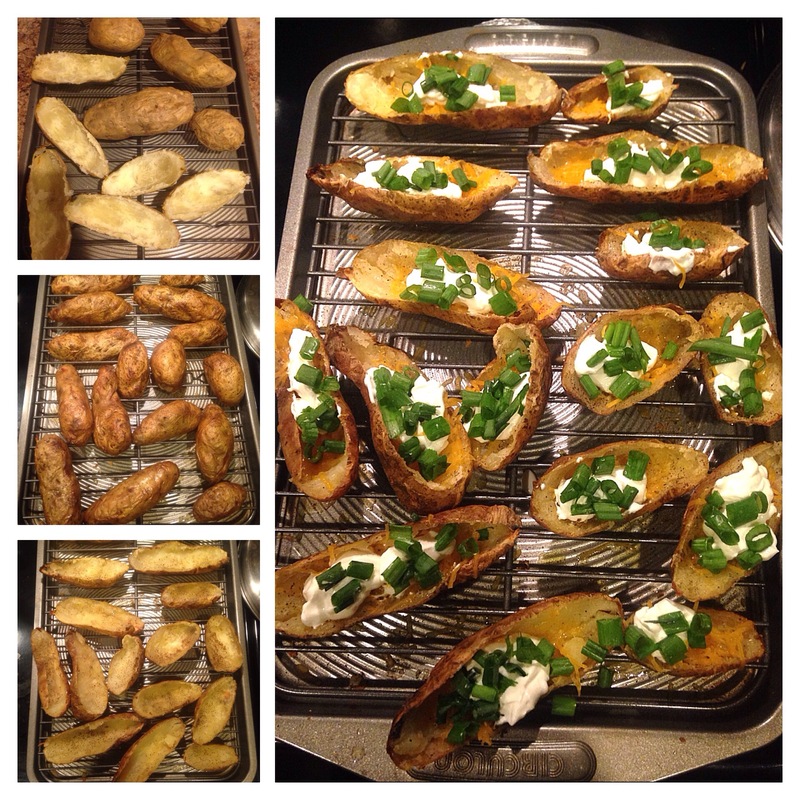 Sooo I decided to take a try at potato skins! It was quick and easy! Of course I left the bacon out but it was just as good! 1. Heat the oven to 400°F and arrange a rack in the middle. 2. Pierce each potato several times with a fork or sharp knife. Place the potatoes directly on the oven rack and bake until the skins are crisp and a knife easily pierces the potatoes, about 50 minutes. Transfer to a wire rack until cool enough to handle, about 10 minutes. Set the oven to broil. 3. Slice each potato in half lengthwise. Using a spoon, scoop out the flesh, leaving about 1/4 inch intact; reserve the flesh for another use. Brush the insides of the potatoes with the melted butter and season with salt and pepper. Flip the potatoes over, brush the skin sides with butter, and season with salt and pepper. 4. Evenly space the potato halves skin-side up on a baking sheet and broil until the butter foams and the skins start to crisp, about 2 to 3 minutes (keep a close watch so they don’t burn). Flip the potato halves over and broil until the top edges just start to brown, about 2 to 3 minutes more. Evenly fill each skin with cheese. 5. Place in the broiler and broil until the cheese is melted and bubbling, about 4 to 5 minutes. Remove from the broiler and top each with 1 teaspoon of the sour cream and a sprinkling of the chives. Previous Post Plants or Plant ?